Reactis® V2014 is ready for download, offering new features as well as performance and stability enhancements. The release includes updates to Reactis, Reactis for C Plugin, and Reactis Model Inspector. New features include support for MATLAB® R2014a, enhanced support of bus objects, Stateflow diagram inspection aids, and new API functions for inserting Validator objectives. 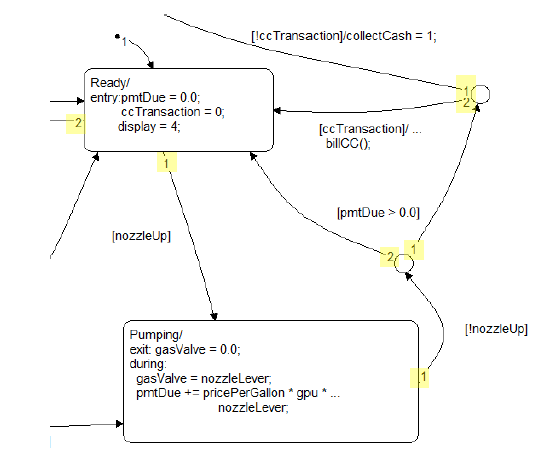 Several enhancements support improved inspection of Stateflow diagrams. For example, you can now hover over a transition segment to see its label highlighted. As shown below this can help identify the segment to which a label belongs. 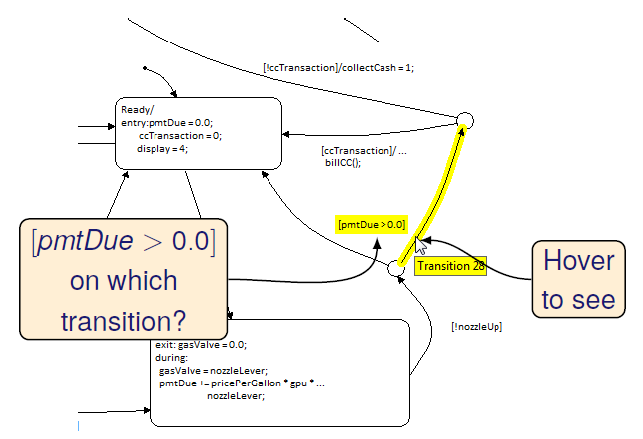 Reactis V2014 also now displays user-defined transition ordering as shown below. In V2014, the Reactis for C Plugin lets you configure what constitutes a decision for tracking Decision, Condition, MC/DC, and MCC coverage. Previously, only the Boolean expressions that determine execution paths were considered decisions. For example, those in an if statement or a while or for loop. The new setting lets you configure Reactis to track decision related coverage for boolean expressions appearing in other parts of a program. For example, the expression e1 in e1 ? e2 : e3 or y || z in the statement x = y || z;.